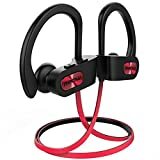 If you’re looking for a pair of Bluetooth headphones that are perfect for workouts but still offer a comfortable fit, solid battery life, and terrific sound quality, today is definitely your lucky day. The Mpow Flame Bluetooth Headphones are IPX7 rated for water-resistance so you never have to worry about sweat during your intense workouts. They also offer up to 9 hours of continuous playback on a single charge so they’ll never die on you during a long run. They best-sellers on Amazon, and they’re somehow on sale right now for just $19.99. Definitely don’t miss this deal.